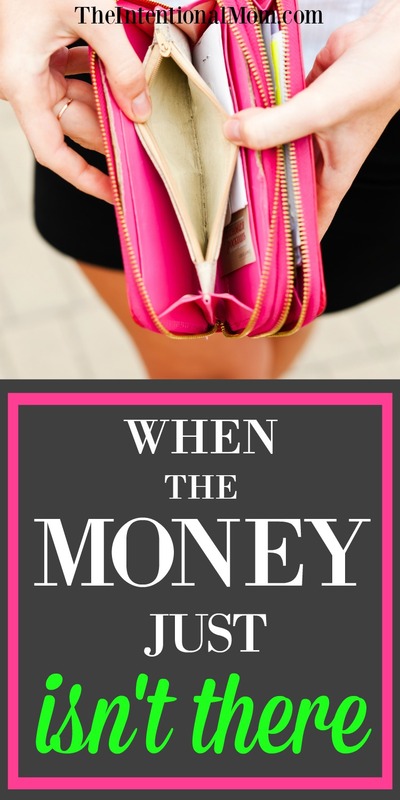 Have you lived through a time when the money just isn’t there? Perhaps you find yourself there right now. Maybe right now you are in a place where you have no money at all. You could be nearing the end of yet another month and have no idea how you’re going to make it all work. Mostly, you know that it won’t work. So, you just hope for the best and know that you’ll be worrying about it when you have to and not one moment sooner. Before you go any further, you need to grab a copy of my monthly budget when our family of 10 survived on less than $25,000 a year. It IS possible! Just enter you email below to get a copy along with blank budget worksheets for you to create your own budget! Enter you email below to grab your worksheets & subscribe to receive other awesome freebies as well! Success! Now check your email to grab your downloads and confirm your email address. If any of this resonates with you, let me encourage you to keep reading. If the money just isn’t there, read on. Let me clarify something with you right off the bat. 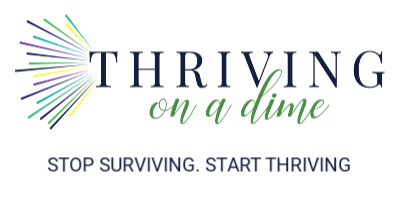 If you are looking for money saving tips that may help during a financial valley in your life, I have so many posts under the frugal tab along the top here on my site that can help with that. In fact, my whole book, How to Be Frugal, is an unpacking of my brain regarding the lessons, tips, tricks, and tools I learned over 20 years of living frugally. If this information is what you are looking for, this is not the post where you will find that kind of information. For several years of our married life, which is now more than 20 years, my husband and I earned a very good living, and we enjoyed a comfortable lifestyle because of it. While we have always lived frugally, even extremely frugally according to the standards that most people have, our lifestyle, our security, and our future was more than comfortable. 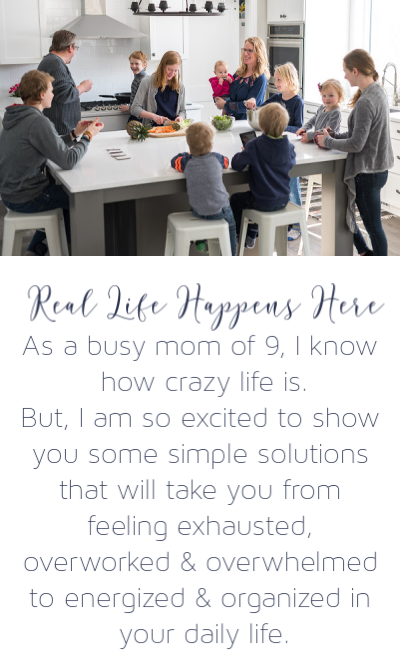 During these times we said no to many luxuries and niceties, but it was completely by choice because we were focused on getting out of debt and being good stewards of the money we had while also supporting a super-sized family that was continually growing. We had good paying jobs and a steady income stream that was more than sufficient. Without warning the rug was pulled out from underneath us and in the blink of an eye, the money was just not there. Have you been there? Are you there? as though everyone else was living in the real world while I was living somewhere completely different. Or at times, I didn’t really even feel like I was living at all. I felt as though I was just surviving. I was only breathing. If you have been here before, or if you are there now, let me tell you, I understand. I, too, have felt that overwhelming despair, that ache in the pit of your stomach, and that sense of panic and dread that is like a noose around your neck, keeping you from ever feeling like you can catch your breath. During this time in my life well meaning people said things to me that they had no idea were literally ripping my insides out. Not in any way on purpose, but things were said that were just a part of their daily life that was light years away from my reality….and no one knew of the reality I actually lived in. I didn’t want anyone to know, really. I think it was all just part of a self-protection mechanism. Every day, all day long, I couldn’t get out from underneath the weight of my reality, and it was all-consuming. I was constantly reminded, day in and day out, that I was on the outside looking in regarding absolutely everything. There was a time when I was working on a project with a group of women for several hours, much longer than anticipated. It was decided that it was time to grab something to eat since it was well past lunch time, which again was completely unplanned. I mumbled some sort of excuse about having to run home to check on the kids so I’d meet them back in an hour to finish. In reality, I just pulled my car around the corner and sat in it without turning it on despite the fact that it was January in Michigan. Of course, this is what I did since I had no money to buy lunch and couldn’t even afford the gas to run the heat in my car. I hoped no one would notice my blue lips and chattering teeth when I got back. Of course, there were endless wedding and baby shower invitations that I simply declined because there was no way that I could afford a gift while pretending that I didn’t know that proper etiquette says that you send a gift anyway. I was no longer able to meet with a group of girls I had been meeting with once a month for years since we always met in a restaurant. I didn’t want to answer questions about why I didn’t even order a simple drink month after month…so I just stopped going. During this time I tried to avoid looking at my bank account online, but when I was forced to, I always arrived on the home page of my account looking through squinting eyes because I was so afraid to see where the balance really was in case something unexpected was withdrawn. It was always amazing to me how one page held months of transactions at a time since there was no money coming and going. Thankfully we had planned well and didn’t have many payments at this time, but since there was literally no money coming in, weeks would go by with no activity in our bank account. Normally our property taxes, which were due two times a year, were carefully budgeted for so when the time came for them to be paid, the money was all there. As the deadline loomed closer and closer, I kept hoping and praying that the money would come from somewhere. When it didn’t, I sold a ton of stuff in order to make the payment. There are countless other stories that I could share to illustrate the extreme despair that I felt during this time, but my desire is to offer you an understanding ear. If I could, I would offer you a seat on my couch and tell you that you aren’t alone, even though it feels like you are. If you were here I’d tell you that it’s ok to let the tears fall sometime. I would tell you that sometimes that pit in your stomach simply won’t go away. I would tell you that I know what it’s like to be given the once over when the person at the pharmacy processes your Medicaid card. I would tell you that I know what it’s like to be completely misjudged and misconstrued by the woman in line behind you, who looks an awful lot like your former self, when she sees you whip out your WIC card to pay for the groceries on the belt in front of you. I would tell you that I know what it’s like to want to explain your story to the person who tells you that your food benefits have run out for the month when you thought you had a little left…but yet you know they wouldn’t really hear you anyway. I would tell you that most people you meet aren’t really interested in hearing about the situations in your life that brought you to the welfare line…they would just rather assume that they know who you are and why you’re there. Most people would rather just assume that you are where you are because you are lazy, lacking, or just interested in getting something for free. The interesting thing is that while others see you as getting things for “free,” they have no idea of the price you are actually paying for your “free” benefits. You are paying for your free benefits with your very soul. While I wouldn’t trade the lessons that I learned during times of hardship, I would tell you that these times of hardship were not fun times to live through. I would have given anything to not be in that place when the money wasn’t there, but this was just not to be. I won’t even tell you that things will get better because I know that you already have plenty of people in your life who tell you that, because in all reality, things will get better… someway, somehow. My purpose is just to sit here with you, grab your hand, and let the tears fall along with yours. If you are living through a time when the money just isn’t there, that’s what I hope I’ve done for you. Are you looking for more encouragement? I can still feel the weight and sadness of my own financial dry years. I think I experienced everything you wrote about. I also had the dread of the phone ringing. The phone calls from my mortgage company. Several times every day, a different person each time, none of them really caring about my situation, just wanting to collect money that wasn’t there. And then having to look at my children and continue making dinner or giving them baths, whatever needed to be done. Whatever I had to do to survive til the next day. Awful. Luckily, the phone ringing was never a concern. The weight. The weight of the experience is almost strangling, isn’t it? Hello. I pinned your post because that is exactly the season I am in now. I lost my professional, 16-year career job almost 4 years ago and haven’t yet found another one. Each day, month, year finds me worried, anxious and as you said, just trying to survive. I have become a loner because I just get tired of making excuses. All that to say, thank you for writing this post, it makes the world seem a little less lonely. you’re welcome. It is such a lonely place to be most of the time, so I am glad you felt less alone after reading. That’s exactly why I wrote it! I am sorry you are in this place. I do so hope you find something soon. I’m sure four years feels like an eternity. Blessings to you! Jennifer, Thank you for your words of encouragement. I too have gone through some tough times in the last couple of years. One thing I did notice was that when you are going through these hard times it really brings out a persons true colors. When the difficulty with our business took place it was at the same time when we signed up for the ACA Healthcare. I have family members who said I am not entitled to healthcare using the ACA. I don’t feel entitled to it, we pay dearly for it each month out of our pockets. We have friends who are self employed such as we are but make a great deal more than we do and they are signed up for the ACA and pay thousands and thousands a year to be signed up to it (they have children). It is based on your income. It’s not a handout!!! Many self-employed people have few healthcare options if some would only understand that. But, while my husband and I were going through this emotionally and financially difficult time we were able to keep our healthcare, thankfully. People are too judgmental by what you drive, where you live, where you went to school, how much you weigh and what you drive. I truly judge someone on their character and if its family that is hateful and judgmental I say stay away from toxic people. I choose to be around people who respect me and love me and if that’s friends over family so be it. I’ve said so many times we don’t have the money for this or that but I don’t feel embarrassed by it, I embrace my frugality. You never know when those tough times will strike again. Even though two years have gone by, we still have to watch every cent we earn. So, I too understand what’s it’s like and hope others know there are many of us out there going through the same thing. They’re not alone and there are kind people out there who understand what they’re going through, those are the ones you want to surround yourself with. Even blogs such as yours which help save money and talk you through the hard times are great reading. Thanks again! Yes! You make such good points. Just like you, I so hope everyone who faces struggles like this would know that they are not alone. Financially difficult times often feel so isolating. I hear from so many people who find hope in this particular post. Thank you for sharing your heart about it.